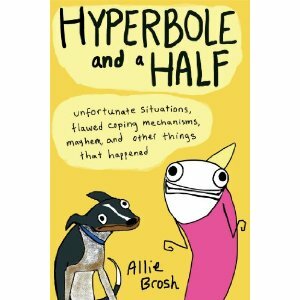 Allie Brosh’s blog, Hyperbole and a Half, is very funny, and I have been reading it for years. She took an extended break from blogging after struggling with some health issues, but had previously announced she was writing a book. I have consequently had this on my Christmas list for years, but I was taking a relatively long flight last week and saw it being promoted in Hudson News in the airport. I could not resist the impulse purchase, and so now the gentleman who was sitting next to me on the plane might think I am a lunatic. So, thank you, Allie Brosh? This book was designed with some fun details – each chapter is printed on different coloured paper, and the paper is glossy as with trade paperback graphic novels. It comes with a glowing review by another of my favourite bloggers, Jenny Lawson (The Bloggess), along with some explanations and lies by the author on the back. As is the case with Lawson’s book, Let’s Pretend this Never Happened, reading a book based partly off a favourite blog means that you will have previously read some of the material. Hyperbole and a Half includes some of Brosh’s most popular posts, including the post about being a grown up that spawned the “Clean All the Things” meme and my favourite, The Party. I don’t mind that these chapters were included, since I tend to go back and reread them every year or so anyways. It also includes her recent chapters about dealing with depression, which are touching and accurate. The new chapters include several meditations on her inner life and personality, but the section that made me cackle on a crowded plane is the introduction. Brosh writes a series of letters to her younger self at a variety of ages, trying to convince herself to stop various strange behaviours. For some reason, the pictures of a young Brosh creepily staring at her sleeping parents and standing naked in a playground absolutely cracked me up. The book is great, just as witty and creative and revealing as one would expect from reading Brosh’s blog. I am already thinking of whom I can lend it to next.